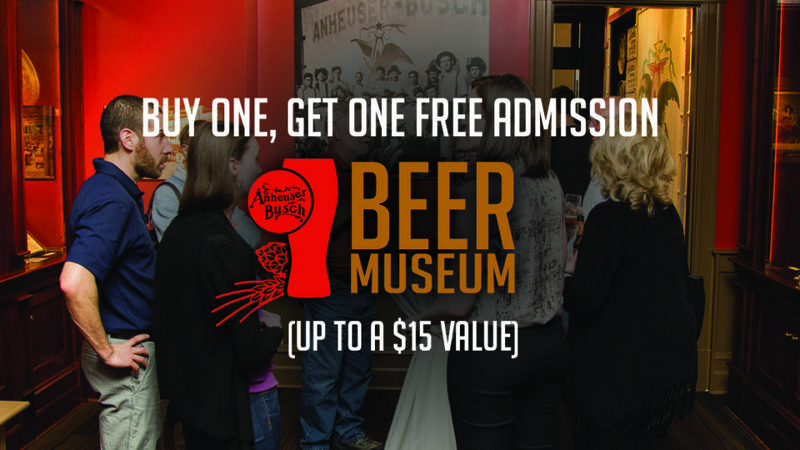 Buy one, get one FREE Beer Museum Tour (up to a $15 value). Not valid with any other offers. Some exclusions apply. Expires 12/30/2019. Book your tour now! Proudly home to one of the top-rated brewery tours in the country, we’re always looking for new ways to showcase our rich company heritage and visitor experiences, especially at our flagship brewery in St. Louis. The Beer Museum Tour was created for those guests looking to find out more about the long and colorful history of our company as well as experiencing and learning about the impressive architecture of our three National Historic Landmarks. (* This tour does not include any in-depth brewing process or packaging information.) You will also visit the historic Old Lyon Schoolhouse building on our St. Louis campus, which is home to a modern museum housing nearly 400 unique historical items from the vast Anheuser-Busch archives. Adult guests interested in exploring the Schoolhouse Museum can enjoy the “Historic Schoolhouse Museum” tour option for $15, guests 3-20 for $5 and guests 2 and under are free. Cost of tour includes stops at all three of the National Historic Landmark buildings on the campus, a brief presentation of the brewing process, a commemorative glass and complimentary beer sample for those 21+.